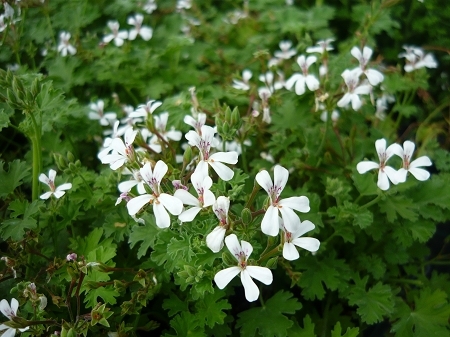 French Vanilla scented Geranium - Leaves have a pleasing vanilla scent. Compact growth habit with sprays of small white flowers when in bloom, good container or hanging basket plant. Full sun, well drained soil. Perennial zone 11+ Live plant in 3 inch container. I've had this plant in my greenhouse all winter and it's been covered in the most graceful sprays of white flowers for months. Its scent is very pleasing and I love smelling it when I walk past.